The 2005 Bowman Draft set has 165 cards. 2005 Bowman Chrome Draft has the same 165 cards plus 15 additional autographs. Cards have jersey swatches from the 2005 Futures Game. 2006 BOWMAN DRAFT PICKS & PROSPECTS BASEBALL GUARANTEED AUTOGRAPH HOT PACK!! 2005 Bowman Draft Jay Bruce Signed Autographed Rookie Card Reds Mariners Auto ! A good product can be carried by one or two cards. Three or four can make a release great. 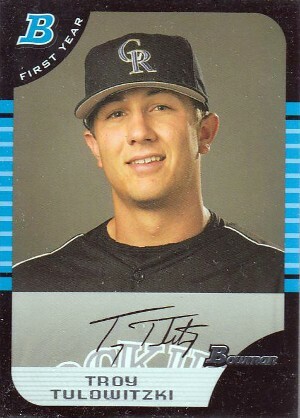 2005 Bowman Draft Picks & Prospects Baseball has almost a dozen including several autographs. 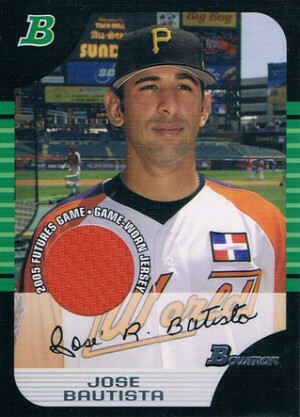 Rookie-wise, 2005 Bowman Draft Baseball is one of the modern hobby's all-time great sets. 2005 Bowman Draft Baseball combines both base Bowman and Bowman Chrome. Each set starts with the same 165 cards. 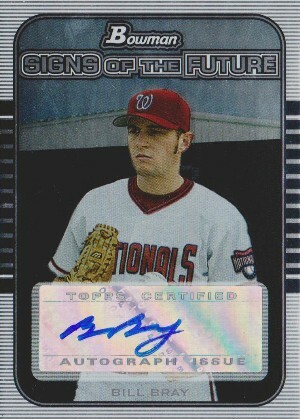 There are also 15 additional Bowman Chrome Autographs (#166-180). 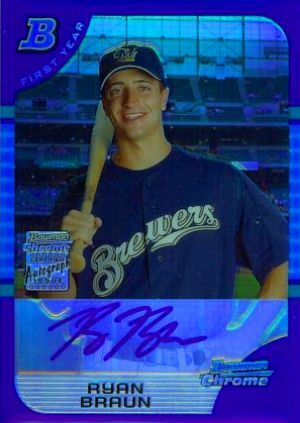 The checklist is led by the Ryan Braun Bowman Chrome autographed rookie card. 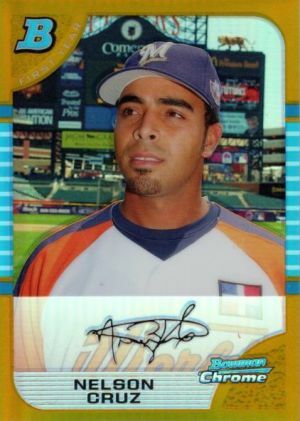 The 2011 National League MVP, he is one of baseball's most popular and collected players. Other autographed highlights include ace pitcher, Jered Weaver, Stephen Drew, Ryan Zimmerman and Jacob Ellsbury (listed as Jacoby). 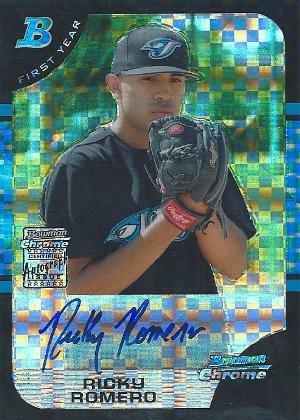 The dark horse card in 2005 Bowman Draft Baseball is Ricky Romero. Playing in Toronto, he doesn't get a lot of attention in the mainstream press. That has kept his autographed rookie card very reasonably priced despite his emergence as one of baseball's best pitchers. 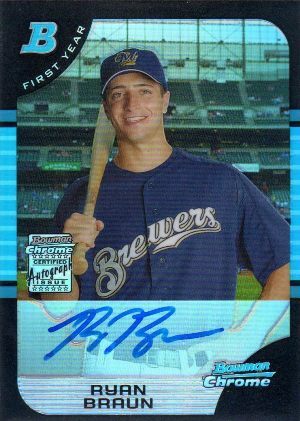 Non-autographed rookie cards available in both 2005 Bowman Draft Baseball and 2005 Bowman Chrome Draft include Andrew McCutchen, Jay Bruce and Nelson Cruz. Like most modern Bowman sets, inserts are led by parallels. 2005 Bowman Chrome Draft Baseball cards have six different Refractors, each with different serial numbering. Base 2005 Bowman Draft Baseball cards have three parallels plus Printing Plates. Other inserts include Base Relic Variations, which have jersey swatches from the 2005 Futures Game, and Signs of the Future Autographs. Hobby boxes have 24 packs of seven cards (four Bowman, one Bowman Gold parallel, two Bowman Chrome). Every box promises one autograph and one relic card. His name actually is Jacoby. Not Jacob. 2005 Bowman CHROME + DRAFT Baseball SEALED Hobby Box lot Verlander AUTO RC?